"Fabergé had his mechanisms made in Switzerland, and he had the portrait miniatures either done by Russians or Germans or Scandinavians," adds Forbes. "He used the best available craftsmen from wherever he could find them to create these objects. But most of the eggs, as far as we know, were made in the workshops of either Michael Perkhin or Henry Wigström, who was sort of the head craftsman. And they had whole teams of people working under them." Fabergé refused to be limited by nineteenth century goldsmith techniques. If methods did not exist to execute his ideas, he required that his craftsmen invent them. In the field of enameling, they developed and perfected techniques that far surpassed those of the competition:"Creating the eggs with the tools that they had, by hand, and making it look as though it was just some miracle that had occurred, is actually an enormous feat of technology," explains author Lynette Proler. "Fabergé used an extraordinarily complicated enameling process, a technique that cannot be duplicated, even today. The House of Fabergé actually buried their own documents, and his formulas and techniques have been lost. They're secreted away someplace, and we're hoping one day that somebody will find them." While his competitors used a standard palette of whites, pale blues, and pink, Fabergé took it upon himself to experiment. He created resplendent yellows, mauves, salmon and all shades of greens – over one hundred forty new colors in all. "Fabergé wrote to his clients saying that everything he produced was one-of-a-kind, guaranteed," adds Von Habsburg. "Anything that was unsold at the end of the year – this was real salesmanship at that time – would be destroyed. So shopping at Fabergé's must have been the ultimate experience, because everything was unique. This is the greatest thing about Fabergé and the reason I admire him most of all. He never repeated himself. Imagine producing 150,000 different objects without repeating yourself!" Fabergé was given carte blanche in creating the Imperial eggs, the only requirement being that each must be unique and each must contain a surprise. Concealing his plans – even from the Tsar – Fabergé would spend nearly a year meticulously designing and crafting appropriate surprises. "And we're told these eggs were, at that time, conversation pieces. 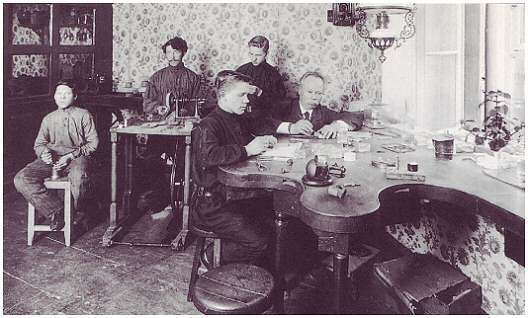 There was no TV and no radio, so people were curious and would discuss what Fabergé was going to be making each year. And even the Tsar would ask, 'What's the surprise going to be in the next running?' But Fabergé would only say, 'Your Majesty will be satisfied.' So it was the best-kept secret in St. Petersburg." 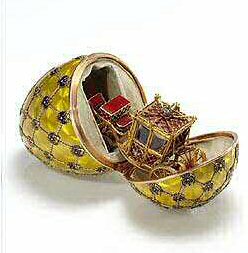 When an egg was complete, it was brought to the palace and presented to the Tsar in person by Fabergé, while the anxious craftsmen remained at their workstations, waiting until Fabergé returned to assure them of its safe delivery. After the death of Alexander III, in the short time remaining before the Easter holiday in 1895, Fabergé had not only to rework the egg that had originally been planned for Maria prior to her husband's death, but also to create an appropriate egg for Alexandra. The Twelve Monograms Egg (1895) was the first Fabergé Egg given by Tsar Nicholas to his mother. Featuring in diamonds the royal insignia of Czar Alexander III set against a deep blue enamel background, Fabergé's understated creation was a fitting tribute for the mourning Dowager Empress. For the new Tsarina, Fabergé trimmed the strawberry red Rosebud Egg (1895) with a diamond Cupid's arrow. The surprise inside was an enameled golden yellow rosebud, another symbol of the couple's love for one another. For the homesick young girl, the egg was also a reminder of her native country of Germany, where the golden yellow rose is the most prized color. Inside the rosebud was a tiny diamond-set Imperial crown, representing Alexandra's new life as the Empress of Russia. 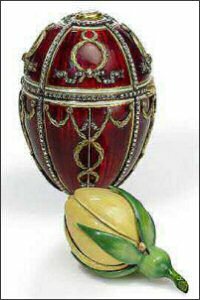 With the success of the Rosebud egg, Fabergé turned his attention toward an ambitious design for the following Easter. On May 9, 1896, Nicholas and Alexandra were crowned in the Uspensky Cathedral in Moscow in one of the most magnificent pageants of Russian history. Fabergé's commemorative, the Coronation Egg (1897), was larger and more lavish than any before. The surface was enameled primrose yellow in a field of starbursts. Trellised with bands of laurel made of gold, each intersection was marked by Imperial eagles bearing tiny diamonds on their chests. But the surprise inside was an even greater achievement: a precise reproduction – under four inches long – of the eighteenth-century coach that carried Alexandra to her coronation. 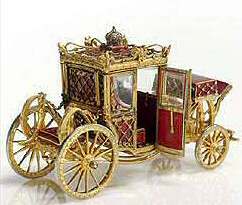 The original carriage was designed for Nicholas' great-great-great-grandmother, Catherine the Great in 1793. During the time it took to complete the replica, master craftsman George Stein made numerous clandestine visits to the imperial stables in order to perfectly match his work to the original. The model mimics every moving part of its prototype, right down to a working suspension. According to author Lynette Proler, "It was all done by hand and crafted by hand in such minute detail – every detail from the state carriage was included – from the little crown on the top of it in diamonds to the windows in rock crystal. And the little steps... when the Empress would alight from the carriage onto the steps, they would fall out of the carriage, and in the little miniature they do the same. 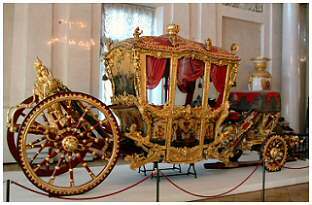 It took approximately fifteen months to craft this carriage by hand working all day and well into the night, seven days a week, and it was barely finished just in time to be presented to the Empress."